The first printing house in Palestine was founded in Safed, and published only six books in its short existence (1577-1587). Hebrew printing in Palestine was re-established by Israel ben Abraham Bak, who brought his printing equipment to Safed in 1831 from Ukraine. He repeatedly lost his printing press whilst in Safed due to an earthquake and riots. Thus in the late 1830s he decided to move the printing house to Jerusalem. As part of his endeavour to promote prosperity in the Holy Land, Moses Montefiore supplied him with new, modern printing press. Hayim Horowitz’s book, Sefer Hibat Yerushalayim was printed in this new printing house in Jerusalem. 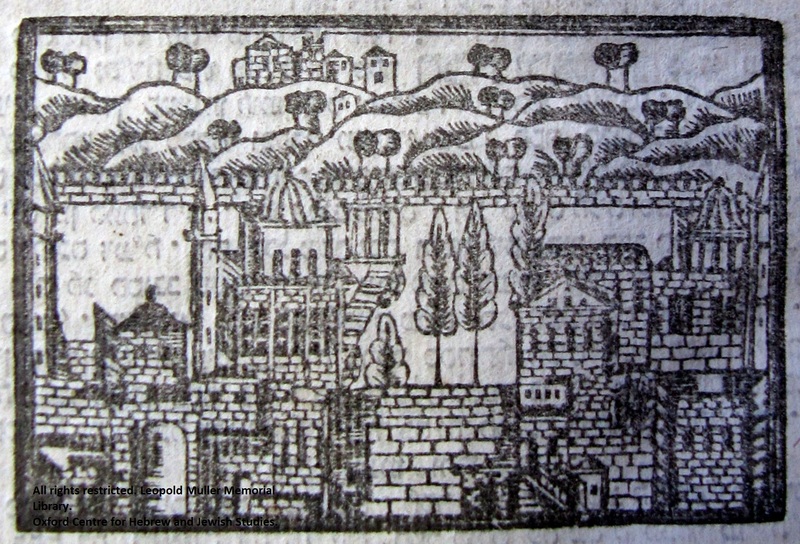 Its title page is dominated by Bak’s impressive printer’s device depicting the major landmarks of Jerusalem: the Western Wall, the Temple Mount and the Mount of Olives. Our copy is signed by Nahman Nathan Coronel Palestinian scholar. 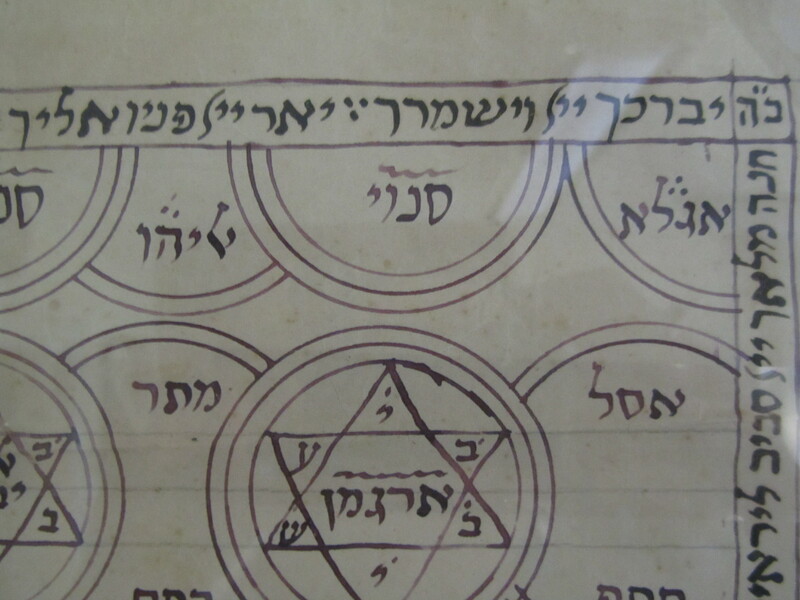 This entry was posted in Hebrew printing, Uncategorized, Western Hebrew Library on 26 February 2014 by zeidlerm. This charm, assumed to have originated in Cairo is part of the Raphael Loewe pamphlet collection. It was probably acquired by Herbert Loewe, Raphael’s father, during his time as Master of English at the schools of the Alliance of Cairo and Abyassiyeh in Egypt. 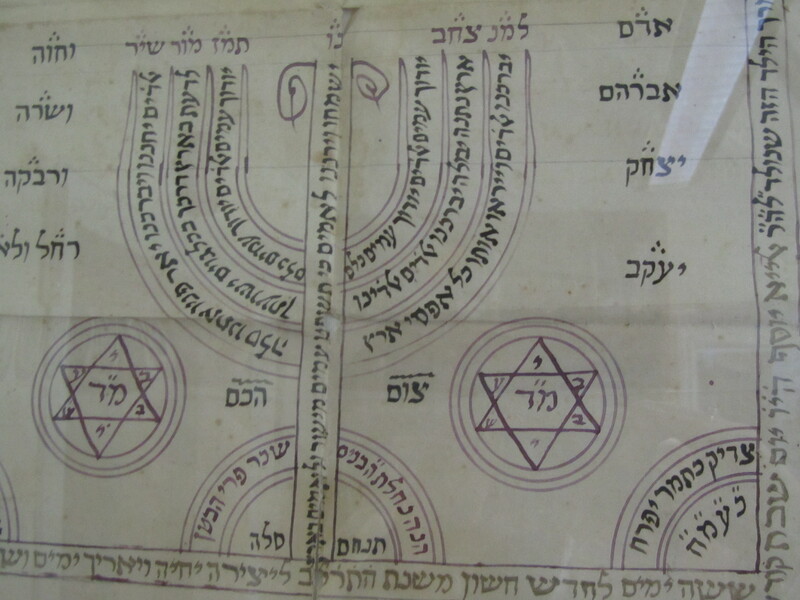 All that is known of the original ownership is the bottom line in the margin: For the son of Elia Joseph, born 6 Marheshvan 5612 [2nd November 1851] (shown in the image below). The Charm would have been placed over the cot as protection. 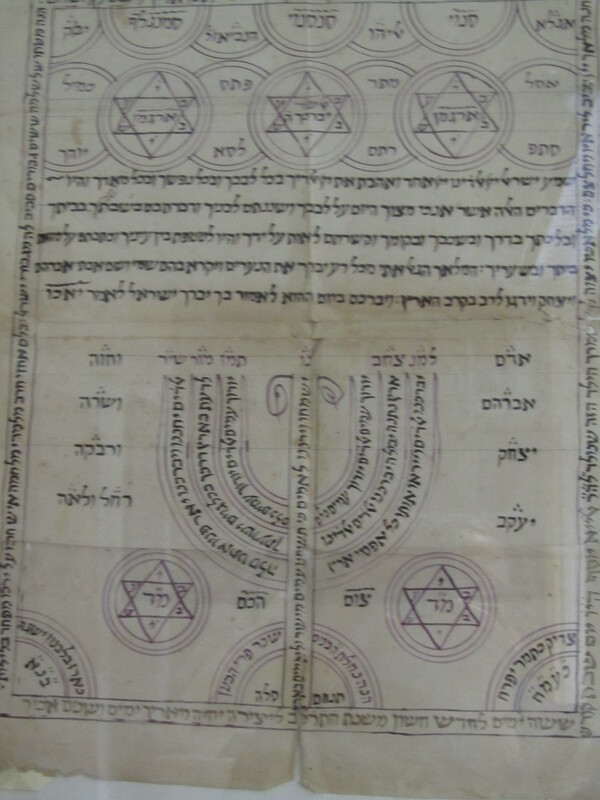 This amulet is decorated with central Kabbalistic symbols including the star of David and the menorah. The Shema is the main text and the seven branches of the menorah are filled with seven verse from Psalm 67. This entry was posted in Highlights, Loewe Archives on 19 February 2014 by zeidlerm. Today’s highlight is another seventeenth-century book printed in Amsterdam by Johannes Jodocus Janssonius (shelfmark: W F823; see also, Constantijn L’Empereur’s commentary on the Book of Daniel). 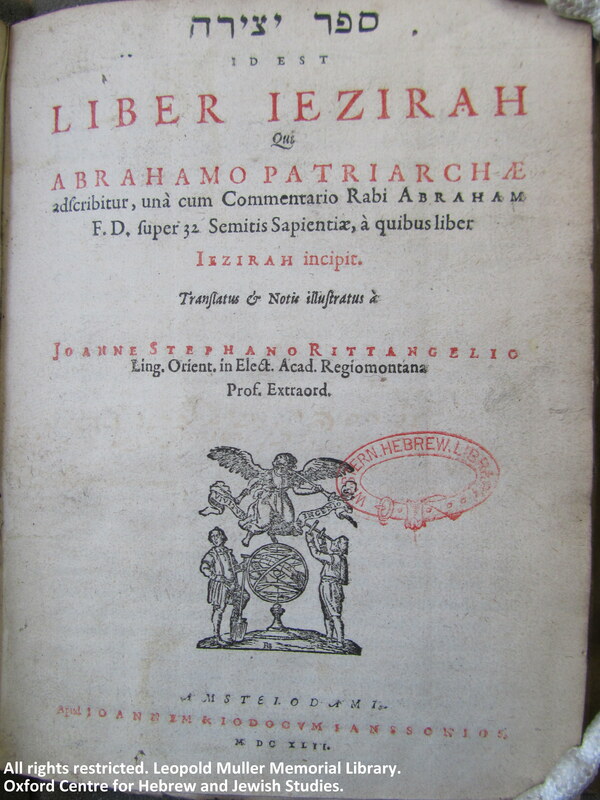 The “Extr aordinary Professor of Semitic Languages” at the University of Koenigsberg, Johannes Stephanus Rittangel (1606-1652) published his Latin translation of Sefer Yetsirah. This was the third latin translation and the first bilingual publication of the famous book of Jewish mysticism. It is not clear whether Rittangel was a converted Jew or a temporary convert to Judaism. He certainly had an excellent command of Hebrew and spent decades among Jews including Karaites of Lithuania. 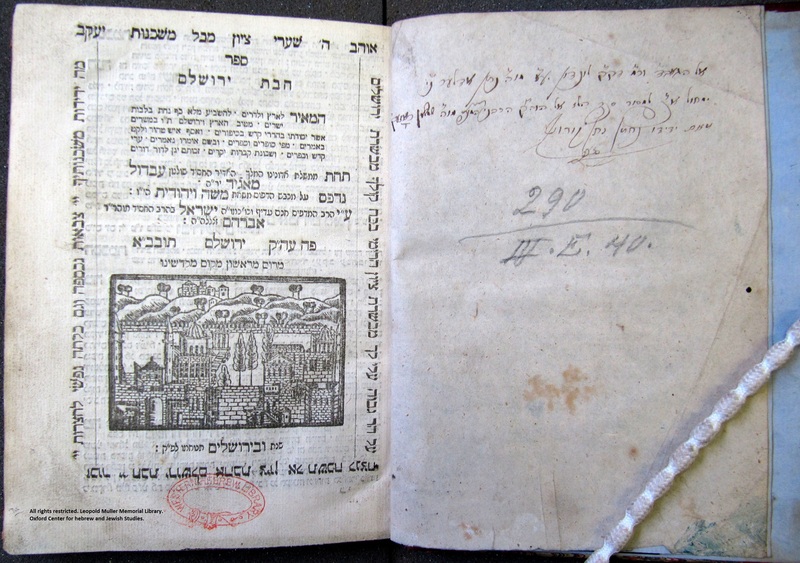 On his way from Lithuania to Konigsberg in 1640 or 1641, he wanted to stop in Amsterdam to publish his translation of Sefer Yetsirah. However, his ship was attacked by pirates and he ended up in England, where he got acquainted with famous Christian Hebraists such as Samuel Hartlib, John Dury and John Selden. He finally published the book in 1642. Although he was undoubtedly knowledgeable, “his abrasive and difficult personality” “made him impossible to deal with” (for more on him, see Daniel J. Lasker, “Karaism and Christian Hebraism: A New Document,” Renaissance Quarterly, 59:4, [Winter, 2006]: 1089-1116).